Hackaday continues to embrace our implacable spinning overlords-of-the-heart. [zazzazzero] posted a YouTube video showing him fidgeting one of those spinners that had been hooked up to a bass guitar pickup. It makes a rather awesome rumbling sound as the pickup registers the bearings rolling around, and when hooked up to a Digidelay effects pedal he moved it beyond the rumble to more of an industrial growl like a factory hum. He also got interesting sounds by tapping on the spinner with a screwdriver. Then he switched up to using an iPad audio app called Shaper to modify the resulting sound far beyond what he had before, with more effects options available at the touch of a button. All of these sounds can be modulated into the analog synthesizer chain, making this spinner a for-reals musical instrument. We’ve published more than a couple pieces on music hacking, including this ASDR envelope generator project and the Atom Smasher guitar pedal. 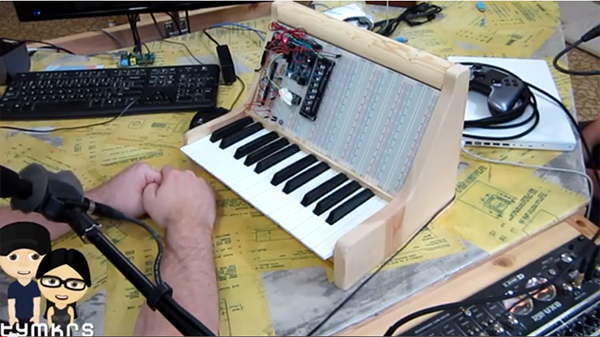 A few years ago, [Chad] wanted to build a musical instrument. Not just any musical instrument, mind you, but one with just intonation. Where modern western music maps 12 semitones onto a logarithmic scale per octave, just temperament uses ratios or fractions to represent notes on a scale. For formal, academic music, it’s quite odd especially if you’re building an analog synth for this temperament. In a remarkable three-part write up (parts one, two, and three), [Chad] goes over the creation of this extremely strange musical instrument. 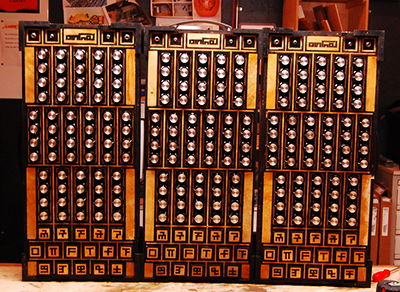 The idea was for this synth to produce sine waves for each of the tones on the just intonated scale. [Chad]’s initial experiments led him down the path of using strings and magnetic pickups to produce these sine waves. These ideas were initially discarded for producing sine waves electronically on dozens of different homemade PCBs, one for each tone. The keys are an extremely interesting design, working on the principle of light from an LED shining on a photodetector, blocked by a shutter on a spring-loaded key made on a laser cutter. The glyphs on the keys seen above actually have meaning; each one describes the ratio of the interval that key plays, encoded in some schema that isn’t quite clear. What does it sound like? There’s three videos below, but because this synth isn’t tuned to the scale you’re used to, it doesn’t sound like anything else you’ve heard before. Building an analog synth is a challenge, but with the [Tymkrs] protosynth, it’s easier than ever. It’s a 25-key keyboard attached to a stack of solderless breadboards to make analog synth prototyping a snap. Earlier, [Tymkrs] acquired a whole bunch of solderless breadboards and decided to put them to use by making a component-level modular synth. The earlier incarnation tied each key on the keyboard to a few wires behind the breadboard and tied them in to a shift register so they could be read with a Propeller dev board loaded up with a Commodore SID emulator. The new version keeps the very clean through-the-back keyboard connector, but this time the [Tymkrs] are adding a few more components that add a sequencer setup and a rotary encoder. The eventual goal for this really cool breadboard synth is to explore the world of Moogs, Arps, and other analog synths easily on a breadbaord. The [Tymkrs] have already put together a breadboard-compatible low pass and high pass filter. While there’s still a lot of work to be done to make an analog synth a reality, the [Tymkrs] are off to a great start.